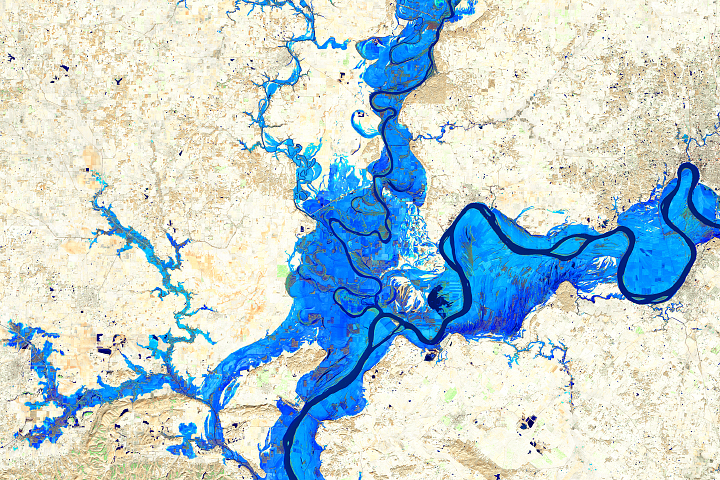 There is a mineral rush underway in the Upper Midwest—for sand. 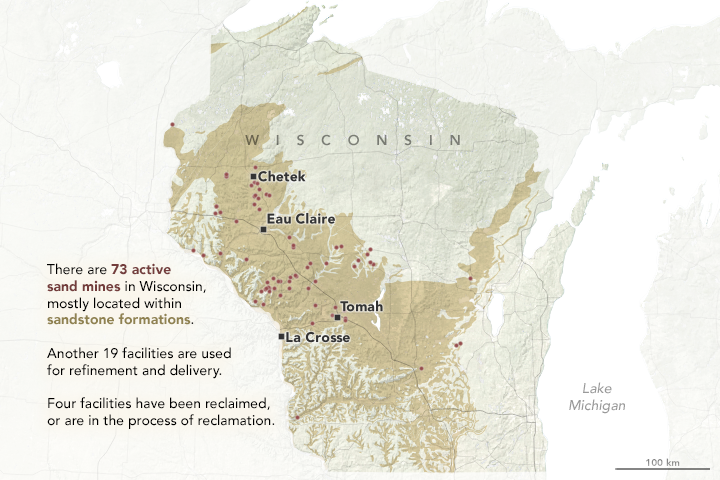 Western Wisconsin, in particular, has become the epicenter of the rush due to the continuing horizontal drilling and hydrologic fracturing, or fracking, boom in the United States. The unusually round, hard, well-sorted, silica-rich sands of western Wisconsin make them ideal frac sand. Gas and oil companies use sand as a “proppant.” Drilling operators add sand to the mix of water and other chemicals that gets pumped underground at high pressures. The force of the liquid and sand mixture creates small fractures in shale rock, and the sand grains help keep these cracks propped open after the pumps turn off. This allows the gas and oil to seep out. 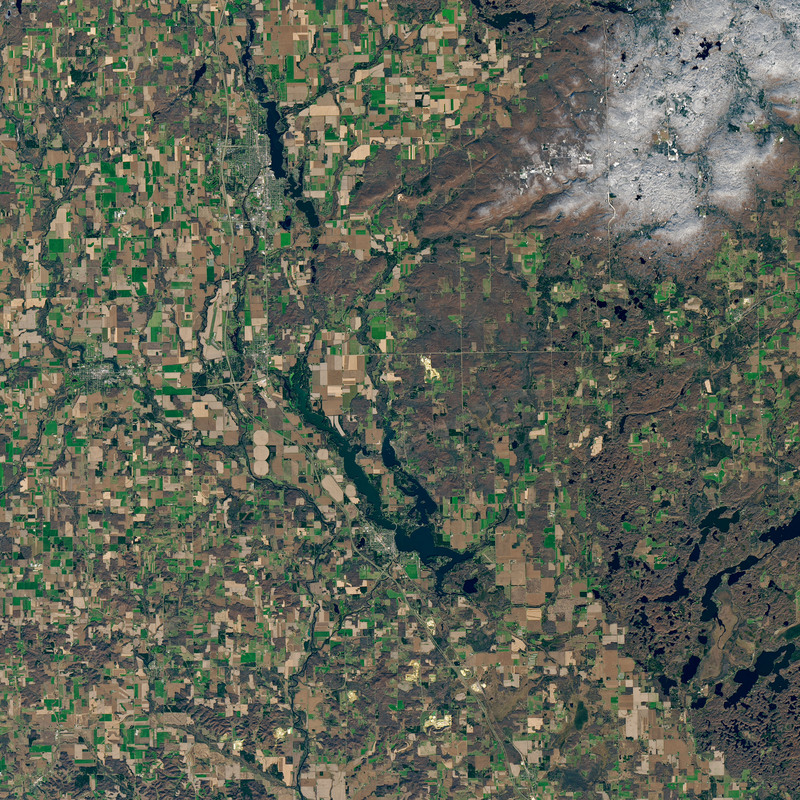 On November 7, 2017, the Operational Land Imager (OLI) on Landsat 8 acquired this image (above) of several sand mines near Chetek, Wisconsin. The mines appear light brown against a background of farmland and forested hills. 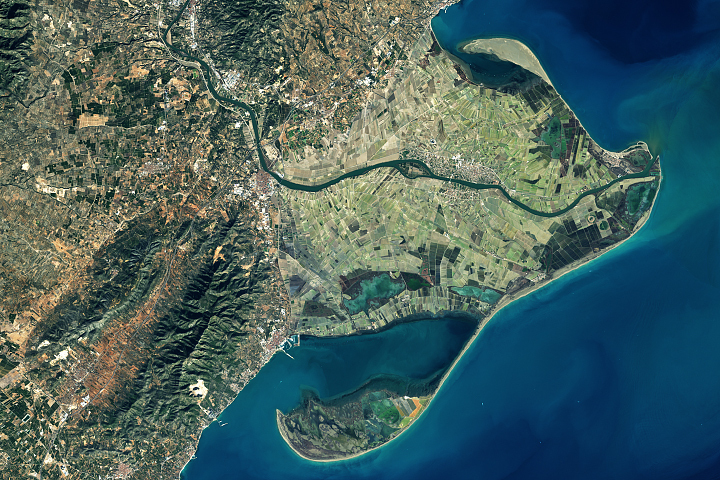 The United States is the world’s largest producer and consumer of industrial sand, though global statistics are incomplete. Nearly half of the frac sand produced in recent years in the United States comes from Wisconsin. The state’s high-quality sands, the proximity to key gas and oil fields, and the easy access to freight rail has made Wisconsin sand particularly desirable. There were 73 active sand mines in the state in 2017, according to Wisconsin’s Department of Natural Resources. Another 19 facilities in the state process extracted sand, which typically involves washing the sand and separating out the grain sizes best suited for fracking. Demand for frac sand dropped in 2016, causing some operators in Wisconsin to idle mines as the price of sand declined. Since then, demand for sand has picked up, and industry observers expect gas and oil companies to use record amounts of frac sand in 2018. That has meant a burst of new activity in Wisconsin’s sand mines, as well the emergence of competing sand mines in other states. In Texas, for instance, as many as 23 new sand mines may open in the Permian Basin in 2018. Fracking is not the only use for industrial sand. Though 63 percent of sand mined in the United States was used for fracking in 2017, other common uses of sand include glassmaking and metal casting. 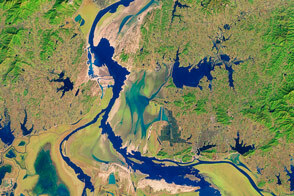 NASA Earth Observatory images by Joshua Stevens, using Landsat data from the U.S. Geological Survey, mining data from the Wisconsin Department of Natural Resources, and geologic information from the U.S. Geological Survey Mineral Resources Program. Story by Adam Voiland. A fracking-fueled demand for round and durable sand has triggered a mining boom in the western part of the state. Geology What is Frac Sand? Accessed March 13, 2018. NPR (2018, January 16) Wisconsin Frac Sand Producers Facing Increased Competition From Texas In 2018. Accessed March 13, 2018. The University of Wisconsin-Extension Mining: Frac sand. Accessed March 13, 2018. U.S. Geological Survey (2015) Frac Sand in the United States—A Geological and Industry Overview. Accessed March 13, 2018. U.S. Geological Survey (2017) Sand and Gravel (Industrial). Accessed March 13, 2018. United Nations Environment Program (2014, March) Sand, rarer than one thinks. Accessed March 13, 2018. Wisconsin State-Journal (2017, May 27) Sand industry back in business in western Wisconsin. Accessed March 13, 2018. 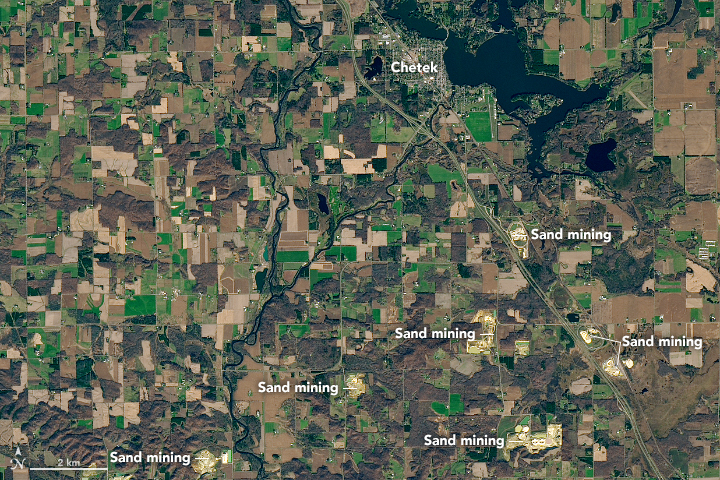 Wisconsin Department of Natural Resources Industrial sand mining overview. Accessed March 13, 2018.